WE GREW FROM A SMALL PIPE MANUFACTURER INTO ONE OF THE LARGEST INDEPENDANT CANADIAN COMPANIES IN THE CONCRETE INDUSTRY. HERE’S OUR STORY. Originally from Matane, Walter Bélanger took an early interest in business: by the age of 20, he already owned his own workhorse store. 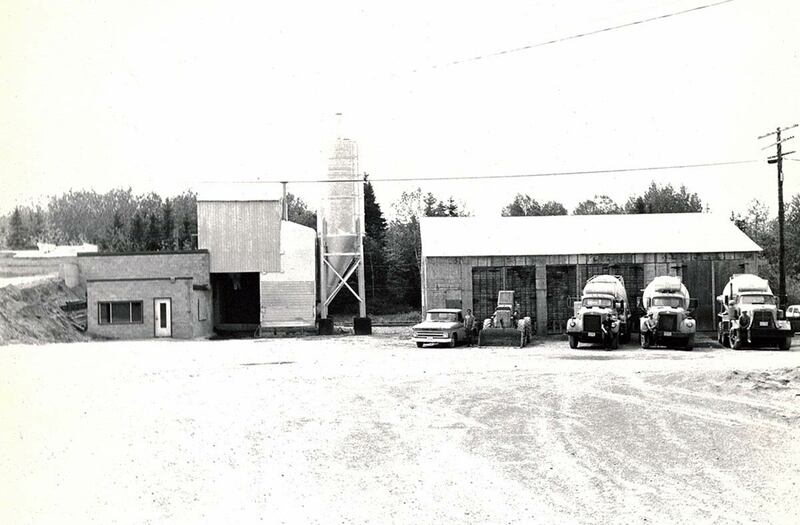 A man of intuition, he could see that machinery would replace horses, and in April 1960, he acquired Deschênes et Bernier, a company that manufactured concrete products. human capital and increase the company’s productivity. with our customers and partners to grow the company. Offering our clients high-quality products and innovative solutions designed for the civil engineering industry, adhering to the agreed-upon specifications and timeline, at a competitive price. Becoming a leader in the Canadian sector of cement concrete and asphalt concrete through acquisitions, partnerships and enhancing production capacity. Market development will create opportunities for employees and long-term value for shareholders, and thus guarantee the company’s longevity. We’ve chosen to invest a great deal of effort and money in research, equipment, training and the company’s culture. Our quality control department includes 4 engineers, 15 experienced technicians, 2 master’s graduates, 2 other master’s students and a doctor of engineering. Our team is extremely well trained, which presents a considerable advantage: when one of our customers has a specific need, we have the resources necessary to come up with the right solution. Finally, we work in close collaboration with the laboratories at Laval University, McGill University, Sherbrooke University, and other large laboratories in Quebec. Many studies have been conducted in Quebec, and our theoretical understanding of concrete has increased enormously. At Béton Provincial, we do all we can to apply this knowledge and encourage eco-friendly practices. One of our environmental commitments is to use as much concrete as necessary, and not a drop more. Cement, an important component of concrete, releases carbon dioxide into the atmosphere when produced. Excess amounts of concrete and waste run counter to eco-friendly usage. This is why we’re constantly working to optimize our concrete usage, by taking the time beforehand to evaluate the minimum quantity necessary in our projects. One of our greatest challenges is to produce a concrete with a longer useful life. We also work to produce concretes that are specially adapted to how they will be used. Durability is our objective. Moreover, we work to design concretes made from recycled materials. For example, we use mineral admixtures from industrial by-products. Finally, in our Tercim products, we produce a standard cement made of 35% recycled materials.